“Because we can,” he told them. They could schedule easy opponents, play overmatched foes, and play in friendly instead of hostile environments. But then what? Would they be challenged? Would they be pushed? Would they be bored? Of course. Deep down no one wants to win all the rest of their games. You must lose sometimes, and they did as they prepared in 2014..
Of course the answer is no. We understand that winning is great, but losing and being challenged and pushed is where young athletes learn the most. We don’t want our kids to play all their games against overmatched teams, or in easy tournaments, because they would eventually get bored and quit. They want to be challenged. Here is the clincher, though. They are OK with losing, and most kids understand it’s part of the process. Sadly, many adults struggle with losing far more than their kids. Angry moms and dads berate their kids and officials from the sidelines, and on the ride home after games. Coaches yell and scream at athletes, or worse yet, don’t even let some kids play in matches because they fear losing. They use physical punishment (running, pushups, etc) when kids make technical errors, instead of teaching them. They scream for more effort from players who have given their all, but haven’t developed the technique and tactical ability to succeed. The response to my question is also predictable from most coaches that come from the “I have always done it this way, that’s how I was coached” camp: crickets, or at most a shrug and shake of the head. As parents and coaches, we too often frame losing as something to always be feared and avoided at all costs. When we do this, we don’t prepare kids for future success; we prepare them for future anxiety (we also encourage cheating but that is a whole different article). There is a better way. Losing can be something positive if framed correctly, especially for young kids. Trust me, I understand how frustrating losing feels, as both a parent and a coach. I want my kids to be successful, and I certainly want my teams to play hard and get some results for their efforts. 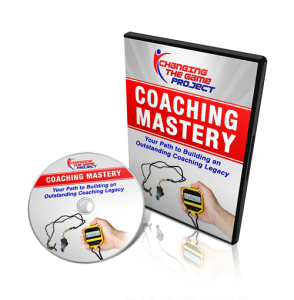 I am disheartened when I see the goals pouring in our goal, and my athletes struggling. I want to fix it. I want to make it better. I want to feel better after the game, and usually venting my frustration makes me feel better. But what about the kids? Does it make them better? There is a better way. It works incredibly well when I am coaching a team, and it works great with my own kids to help after a tough loss. What went well out there? Why are we better because we lost today? I learned these three questions from my great friend Dr. Jerry Lynch, author of the outstanding new book Let Them Play: The Mindful Way to Parent Kids for Fun and Success in Sports. Dr. Lynch has been part of over 30 national and world champion teams on the collegiate and professional level, so when he makes a recommendation on how to help a team or athlete, I tend to listen. Here is why these questions work. Obviously, we lost, so not everything went well. But this is sports, there is always something that needs work, right? We often underemphasize “what needs work” when we win, and overemphasize it when we lose, so asking this in both cases provides balance. We have acknowledged the good, now let’s acknowledge the things we have to put in some extra work on. Did we defend well as a team? How is our fitness? Are we working hard for each other offensively? As a parent, you can ask your son or daughter what things they can focus on in training that week, or better yet, what can they accomplish outside of practice to improve their play. Athletes must be prepared to receive critical feedback from their coaches regardless of the result, and asking them to identify what needs to be worked on is far more effective than simply lecturing them. Why are we a better team/athlete because we lost today? This question is the clincher. Development is a process. It is a marathon, not a sprint. There are going to be ups and downs, and the critical thing is we continually learn and improve. The outcome of the competition cannot be changed, but we can influence the outcome of our next event, and our preparation for it. This question helps athletes frame the loss, and take ownership of the training and preparation for the next match. For example, your team might say “We are better because we learned that when we don’t defend as a team, we get scored on a lot. We need to focus on team defending if we are going to be successful next match.” Your athlete might say “I am better because I learned that against a good team, I have to play a lot quicker, so I will be focused on that in practice this week.” This question opens the door to a path forward, helps them move on from the loss, and gives them ownership over their preparation for the upcoming contest. Why are we a better team because we lost today? When a coach asks his or her team these three questions, losing is no longer a scary moment; it becomes a teachable moment. You build a stronger connection with your athletes, you put the loss in the past, and you get your athletes refocused on the process of getting better. Most importantly, you demonstrate that you are in this together. Your athletes will love you for it. Parents, when you ask your kids these three questions, you remind them that it’s the process, not just the outcome, that matters. You help them take ownership of their improvement, and focus on both their strengths and weaknesses. You also let them know that you are in it with them, whether its good, its bad, or it’s ugly. It lets them know that you don’t simply love watching them win, but that you love watching them play! Next time your team is loses, take a deep breath, and ask the three magic questions. You will be glad you did. And so will your kids.